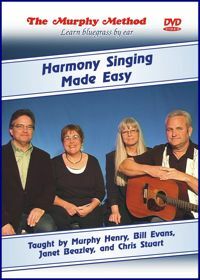 Harmony Singing Made Easy teaches you to sing harmony by ear. Murphy and friends Bill Evans, Janet Beazley, and Chris Stuart join together to sing some beautiful trios and quartets. First you hear the three (or four) voices blending together, then you hear each harmony part sung separately. You learn your part by singing along with us. We sing several songs in three different keys so no matter what your vocal range you can try your hand at singing the lead part. Sometimes the men (Bill, Chris) take the lead; sometimes the women (Murphy, Janet) take the lead. With three keys to choose from, you can also find a harmony part to suit your voice. Along the way we offer some helpful hints such as “What key do I sing in?” “How do I find my harmony part?” and “How can I get a good blend?” At the very end Murphy and Bill break out their banjos for a rousing quartet version of "Over in the Gloryland." Very entertaining! If you’ve been wondering how to sing harmony, we’ve made it as easy as possible. Or as we say in Virginia, “It’s as easy as pie.” Read even more details on our blog.